The series “Azgapatum,” compiles the history of the Armenian Church and the Armenian people beginning with 301 AD, the year Armenia adopted Christianity, through the end of the 20th century. 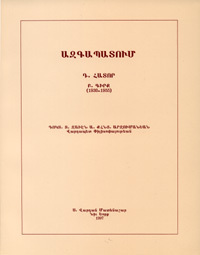 The author of the first three volumes, His Beatitude Maghakia Ormanian, (1841-1918) served as the Armenian Patriarch of Constantinople from 1896 until 1908 when he was removed from office by the Young Turk Party. He spent the rest of his life writing several monumental books including “Azgapatum” (National History). The work of noting important events in the Armenian Church’s history was continued by Rev. Fr. Zaven Arzoumanian, Ph.D who published three more volumes (divided into the following years: 1910-1930; 1930-1955; 1955-1995). An expert in the history of the Armenian Church, Rev. Fr. Arzoumanian received his Ph.D from Columbia University and has published numerous books about religion and philosophy. priests to bring us out of our slumber.